My strongest memory of heart-pounding, belly-twisting nervousness (it’s more anxiety than nervousness) was this morning. Seriously, I am having a bad and weird day. I was super exhausted last night and I’m not sure whether I didn’t set my alarm last night or my alarm didn’t go off this morning or what. When I open my eyes this morning, it took me a second to register my clock read 8:09. I’ve overslept. 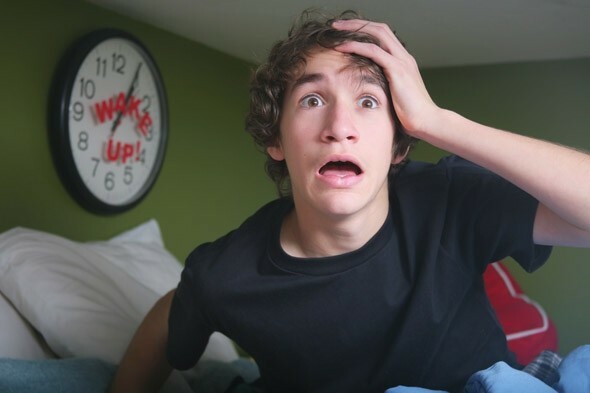 Thank god the alarm clock is off by 10 minutes and that it’s actually 7:59 but still I overslept. My chest was pounding as I almost fell out of bed. “Oh my god,” I kept saying as I dressed, brushed my teeth, and pulled my hair into a ponytail. I stuffed all my things into my backpack, grabbed a pair of socks, and a breakfast shake and I was out of the door. When I got to the garage, I pressed the button to open the trunk, the trunk didn’t pop. That’s weird, I thought. I pressed again, still, nothing. I was really scared then and it left me with no choice but to do it the old-fashion way, open it with the key. On the way to school, I blamed my mom, blaming her for causing me to oversleep, blaming her that she’d done something to the trunk last night when she was moving all the things we got from her friend’s daughter’s apartment to the garage. It was partly her fault because she knew I have school today and still dragged me to her friend’s daughter’s apartment in Salt Lake City last night. For two hours last night, I spent moving back and forth with pots, pans, and boxes of seasonings from the apartment to the car. Her friend’s daughter and I’ve known each other since I was five and she was four, so you can technically call her my childhood friend. Four years ago, she moved to Salt Lake City to attend college there. Last December, she graduated with a Bachelor in Business. Now that she’s graduated, it’s time for her to return her apartment keys to the landlord. Her landlord’s given her two days to move out but the apartment is still piled high with stuff. Seriously, I have never seen so much stuff in my life. I should had secretly taken a picture but I didn’t bring anything with me last night. We didn’t spend two hours helping her pack last night, if that’s what you’re wondering. She’s rich, she has people for that. No, her mom has requested her to give her stuff away and only keep the essentials. Her mom has also bought so much stuff that her house in California has no more room. Even her brand-new BMW has to park on the street. My mom spent two hours last night digging through through the things like people searching for priceless junk at the thrift store. I stood out of the way, only helping to transfer the things into the car. At the end of two hours, the back-seat of the car plus the trunk was so full that I couldn’t put another thing in there. So we decided to come home and go again tonight. The best thing I got last night was my friend’s radio with the iPod plugin. My iPod’s battery is getting worse and worse and I’m pretty sure that I have to replace it soon. I mean I can only get through 200 songs now and it needs a recharge. Getting this radio is like the thing I wanted for a long time because if my iPod battery is going bad, I might as well listen to my music on AC power. My favorite: I’ve been looking for ya! I’ve had this kind of radio once but it broke within 3 months of purchase. So I had to returned for a refund and since then, I didn’t dare to buy another one. My friend’s radio looked promising since it costed her $200 and I thought, that has to be something if she’s willing to pay $200 for an alarm clock-radio. And it is. 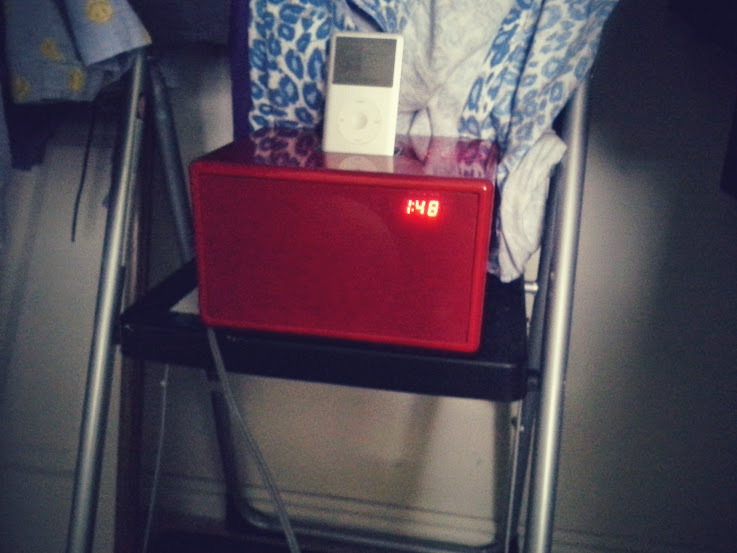 The sound from its speaker is magnificent and it can charge my ancient iPod and that is all I want. Just please last this time. As for the trunk of the car, well, I guess I’ll wait for my mom to fix it. I saw her do something to it last night. So I’m pretty sure she can fix it. Nice radio ! Hope it lasts for you. What a night and morning! I hate that feeling of having to hurry, when you are running late. Hope you made it to school on time. I did make it to school on time, thank you but I’m with you, I do not like the feeling. Oh, that’s good. And hope you get the car trunk fixed, too! Yeah, I hope it’s nothing major.